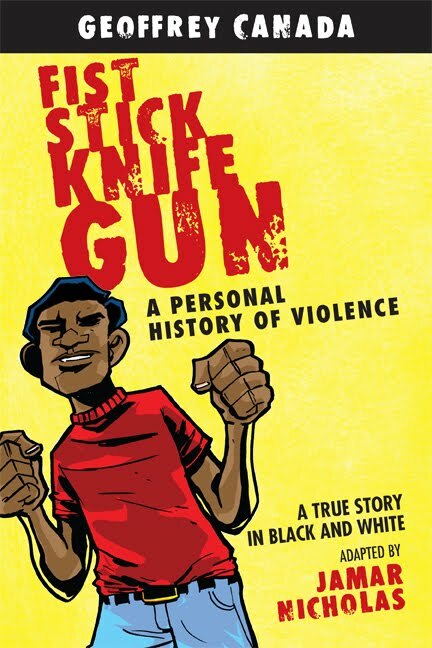 As I noted yesterday, I just picked up the graphic novel version of Geoffrey Canada's Fist Stick Knife Gun: A Personal History of Violence. I haven't read the original to make direct comparisons, so I have to base the story exclusively on what's presented here. The story is essentially an autobiography of Canada, chronicling his childhood in the Bronx from age 4 until age 19 when he went off to college. The story largely focuses on his street education. How to fight, how to deal with thugs, how to look out for one's own. It sounded like a very harsh life, and one that I could only distantly relate to, having grown up in a small rural town with a population just over 7,000. But it's a not unfamiliar tale, bearing some basic similarities to many other "growing up on the streets" stories, both real and fictional. Jamar Nicholas' art works surprisingly well for me. His drawing style does not lend to a lot of facial details, but individual characters are still pretty well delineated throughout the book. Doubling challenging, of course, is that many of the characters age considerably and change their appearance as a consequence. But Nicholas is able to keep things moving smoothly, and there was only one instance going into a new scene where I had any question at all about some of the characters. I also particularly liked some of the visual metaphors Nicholas used. Most notably, the chapter "titles" are actually icons relevant to the theme of that chapter. This is carried through to the Table of Contents, as well, which amusingly almost looks more like a worksheet for a kindergardener than a Table of Contents. As near as I can tell, Nicholas also did the lettering, which I have to say was a little distracting unfortunately. First, the main font used didn't sit with me very well; it wasn't Comic Sans but it felt an awful lot like it. Second, there were any number of repeated gaffs on the capital "I" rule. (For those who don't know, you should only use an "I" with the upper and lower crossbars when it's meant to be a capital. A simple, straight vertical "I" is used for lower case. In this book, both versions are used intermittently.) Third, the font size changed repeatedly, sometimes within a single panel, with the only evident rationale seemingly being how well the amount of text filled up the space. Oh, there were instances where the font size was changed to show emphasis or volume, but there were also many times where the size changed for no obviously good reason. As far as the story itself, it mostly flowed pretty well. As Canada grows up in the story, he faces more and more dangerous threats, and he's forced to learn more and more violent methods of resolving them. I felt a bit let down with the ending, though. Chapter 8 takes place when Canada was 12. Chapter 9 is noted dated, but Canada is drawn pretty much the same and it's presented as occurring not long after the previous part of the story. Chapter 10, though, jumps to Canada at age 19 and in college. Given the fairly slow and smooth transitions between previous chapters, this was a bit of discord. In the chapter, he buys a gun and uses it for protection. This thematically follows along with much of the rest of the book and makes sense as his next logical step. But then, without actually using the gun on anyone, without even having to threaten anyone with it, he suddenly realizes what it might mean if he did. So he throws the gun out. End of story. There's a prose epilogue about how violence begets violence, and how he believes that we have to start teaching children alternatives to violence. Which is a good message, certainly, and he backs it up with his public works, so kudos there. But from a story perspective, it falls a little flat. He's spent the entire story learning about how to be violent in the most effective means possible and then, literally on the second to last page, does a 180 and decides he doesn't want to do that any more. He cites strong religious convictions that won out but, given that religion wasn't mentioned anywhere prior to that point in any capacity, it seems a bit hollow. Like I said, I haven't read the original version of the book. Given that it's clearly stated as being "adapted" to the graphic novel format, though, I have to wonder how much was omitted here. For as smoothly as the majority of the book goes, it almost seems to me as if three or four chapters were cut/reworked into the what's presented as the last chapter here. Whether that was a space or time limitation, or some sort of editorial fiat, I can't say, but I think it's unfortunate because it seems to diminish the impact the story could have had. Especially with the younger crowd who this seems to be aimed at. While I did have some problems with some of the more technical aspects of the book, I think I could've gotten past those if it had a "proper" ending. As it stands, I'm not sure what young adults might get out of it, other than perhaps a Cliff's Notes version of the original if they need to do a book report on it.